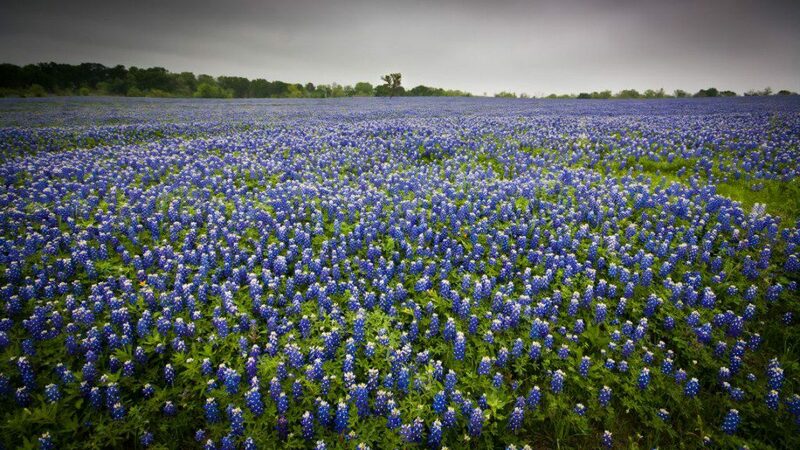 Venture with the Virginia Native Plant Society to the Texas Hill Country from March 25-29, 2019, in search of Bluebonnets and other Texas wildflowers. We’ll visit three iconic cities—Austin, Fredericksburg and San Antonio—and explore diverse landscapes along the way. On Monday, March 25, we will fly to Austin, stay at Aloft Austin Downtown Hotel, enjoy a group dinner, and walk to Congress Avenue Bridge to watch bats emerge. Tuesday we will take a guided tour at Lady Bird Johnson Wildflower Center in the morning— learning about the plants we are likely to see during our visit to Texas. Then, en route to Fredericksburg, we will enjoy a box lunch and stop to explore the canyon, cave, and grotto at the West Cave Outdoor Discovery Center. We will also visit wineries and Wildseed Farms along the way. After a group dinner at a working ranch, we will spend the night at the Peach Tree Inn in Fredericksburg. On Wednesday morning, we will join a docent from the local native plant society to tour the Fredericksburg Nature Center, where trails meander through diverse habitats with many species of forbs, woody plants, and grasses. In the late afternoon, we will visit the Kerrville Riverside Park, which has an interpretive center and paved trails along river and bluff, good for birding. The two-acre garden/arboretum includes more than 100 species of native trees and shrubs plus 200+ species of wildflowers, grasses, and ferns. In between, we will return to Fredericksburg for lunch and midday excursions that might include Enchanted Rock Dome, Museum of the Pacific War or the LBJ Ranch. By Thursday we move on to Friedrich Wilderness Park—home for rare birds, terrestrial orchids, steep hills, and deep canyons. The park is internationally known for bird watching. After lunch at the Sea Island Shrimp House, a San Antonio classic, we head to Medina River Natural Area, a 500-acre landscape that showcases a rich pecan and bald cypress trees habitat with cactus and honey mesquite that dot the upland trails. We then return to San Antonio proper to the historic Menger Hotel near the Alamo. That evening participants will be on their own to explore the River Walk and San Antonio. On our last day in Texas we will visit the San Antonio Botanic Garden, named “one of The South’s Best Botanical Gardens” by Southern Living in March 2017. Walk through native plant gardens representing three different ecosystems—East Texas Pineywoods, Hill Country, and South Texas. On the way to the airport we will stop for lunch at another San Antonio icon, Tomatillos Cafe and Cantina, before flying home. The Texas Hill Country Field Trip is limited to 21 people with a cost of $750 per person double occupancy and $1050 for single occupancy. Airfare and meals (except lunch and dinner on Tuesday) are not included. A $250 deposit is due at time of registration and full payment by January 31, 2019. Cancellation and refund requests will be accepted until January 1, 2019. Fees include a $200 donation to VNPS. Registration for the Texas Hill Country Trip is full. If you wish to continue to register, you will be added to the waiting list. If you are already registered, please pay your remaining balance by January 31, 2019. Questions? Contact Janet Pawlukiewicz at janetjed@gmail.com.